The dining room is covered with banners and flags of the like you see at a grand opening, either remnants of the not-so-distant actual grand opening, or more likely just festive decoration, as they moved from their previous location over a year ago. With a simple menu and 100% exclusively Chinese clientele, you pretty much are assured that Lao Bei Fang is doing something right. Great prices, great dumplings, great noodles. The fried pork & leek dumplings ($1.50/4 or $2.75/8, above) are above average for sure, although not mind-altering. They do get the job done, and really who can complain about a tasty, filling meal that clocks in under three dollars. 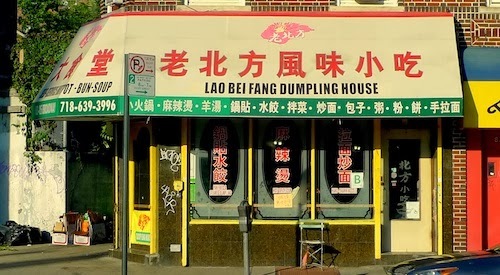 Even though the place has "dumpling house" in the title, I noticed most people here were slurping noodle soups. You will also hear the thump of these hand-pulled noodles being made throughout your meal, as the always entertaining throw-twist-pull motions of noodle-making accompany the atmosphere. We ordered the tendon & beef noodles ($5.25, below), which showcases the very soft and fresh noodles with meaty and chewy chunks (detail below). The broth is not too salty and the dish proves why people here come for the soup. 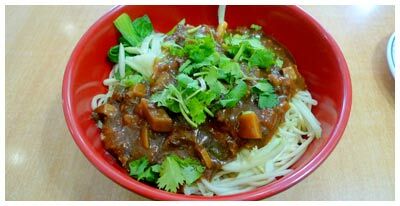 For something without broth, try the delicious meat and bean sauce noodle ($4.50, below), a cold dish served with noodles on the al dente side. The flavors are subtle but very satisfying, especially on a warm day. And finally, the steamed pork bun ($0.75, below) is probably the most caloric intake you can get in the United States for 75 cents. That bun you see is almost as big as your face, and all parts of it are delicious. So celebrate the "grand opening" in style and get out to Elmhurst quick!